The Load (Serbian: Teret, Терет) is a 2018 Serbian war drama film directed by Ognjen Glavonić. It was selected to screen in the Directors’ Fortnight section at the 2018 Cannes Film Festival. It also won the Golden Pram Award for Best Feature Film at the 2018 Zagreb Film Festival. 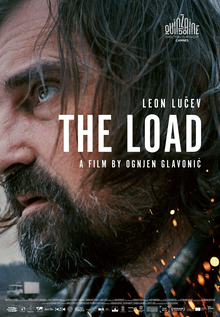 The Load (Serbian: Teret, Терет) is a 2018 Serbian war drama film directed by Ognjen Glavonić. 1999, while Serbia is bombed by NATO, Vlada works as a truck driver. In his truck, he transports a mysterious load from Kosovo to Belgrade and crosses a territory marked by war. When his task is over, he will have to go home and live with the consequences of his actions. Did Vlada the son of Leka helped the survivor to escape from his truck or not? You better watch this movie! It was selected to screen in the Directors’ Fortnight section at the 2018 Cannes Film Festival. It also won the Golden Pram Award for Best Feature Film at the 2018 Zagreb Film Festival.